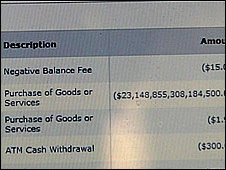 Vetty Officer's Weblog: Cost of a cigarettes pack is $23,148,855,308,184,500 !!! Cost of a cigarettes pack is $23,148,855,308,184,500 !!! Josh Muszynski, from New Hampshire bought a pack of cigarettes in a store using his credit card. A few hours later, back at home, when he checked his online bank account, he was shocked to see the amount that was charged for that single pack of cigarettes. $23,148,855,308,184,500 was charged for that. Göran Andersson, a member of stackoverflow.com, seemed to have cracked this bug. According to him, this huge value when converted into cents becomes 2314885530818450000 and then again when converted to Hexadecimal becomes 2020 2020 2020 1250. "20" is the code for space in Hexadecimal which means 6 white spaces before the actual cost have caused this error. I don't know if the cost of a pack of cigarettesin New Hampshire is $46.88 but if Göran is right, then one fact is sure - Developing silly bugs is a Universal pattern!!! I love that $15 overdraft fee that was charged to his account! thats funny! By the way I didn't know in US credit cards allow such huge amount in overdraft.